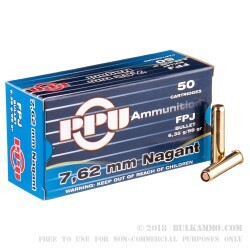 This bulk case of 7.62x38mm ammo is a great opportunity to stock up on ammo for you Nagant revolver. 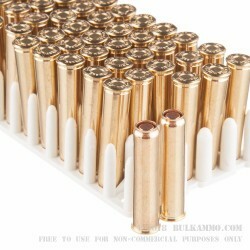 This case contains 500 brass-cased cartridges with 98gr full metal jacket flat nose (FMJ-FN) bullets. The FMJ-FN offers the accuracy of a wadcutter but with the smooth feeding of the FMJ, making this a highly functional projectile for revolver training. 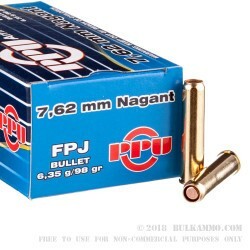 Traditionally low velocity, the 98gr FMJ-FN exits the muzzle at about 738 fps with 119 ft/lbs of corresponding energy. The FMJ-FN offers affordable accuracy for long days on the range, and the round holes created by the flat nose make scoring a breeze. Prvi Partizan manufactures these 7.62x38mm cartridges using Boxer-primed brass casings and non-corrosive propellants. 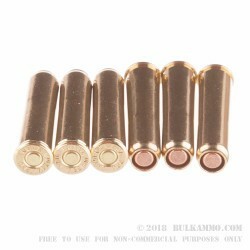 The brass case fully extends past the nose of the bullet which creates a gas seal. The casings are new production and reloadable.